In celebration of love on a beautiful valentine day, superstar Nigerian singer, Davido has sent valentine wishes to all the women in his life. While admitting that he’s got many women in his life, Davido wished his daughters, their mothers and the love of his life Chioma in a single snapchat post. 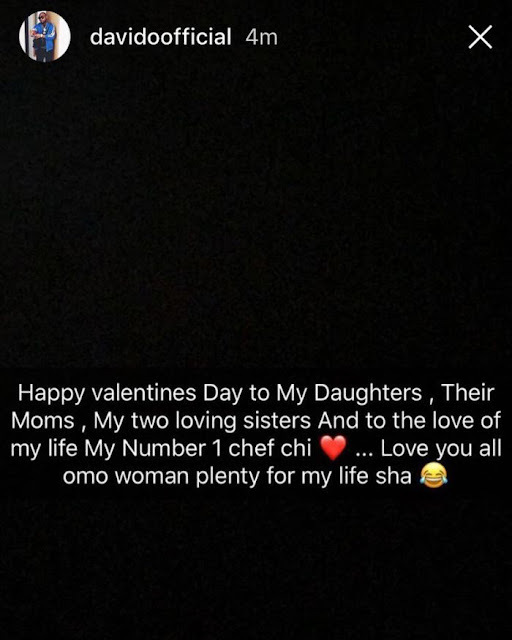 0 Response to "“Women Plenty For My Life Sha” – Davido Sends Valentine Message To His Daughters, Babymamas & Girlfriend"